Following is a blog post I recently published for everybody interested in evergreen plumerias…..
Plants of the species Plumeria obtusa can grow to small shrubs or large trees depending on the variety one chooses. Plants of this species are considered evergreens as they don’t shed all of their leaves during the shorter days of the year compared to other plumeria species. The leaves, formed near the tip of the branches, have characteristically oblong shape with the tips being blunt, obtuse, which gives the species its name. The color of the leaves is dark green with a glossy shine. Flowers develop on the inflorescences, flower stalks, at the tip of the branches. In the early 1930s Mr. Harold Lyon brought the first cutting of Plumeria obtusa from Singapore to Hawaii and it was thus given the name, ‘Singapore’. 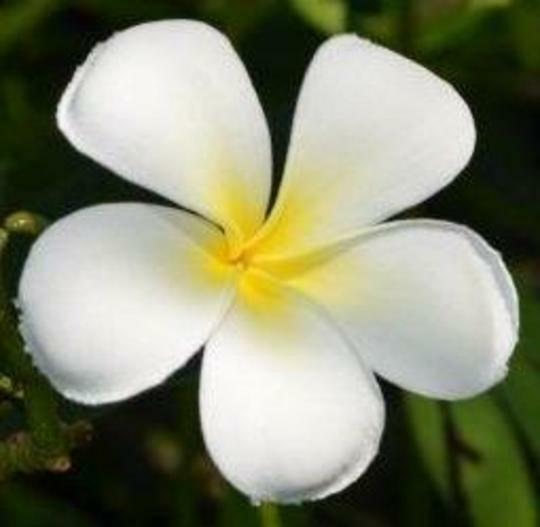 Plumeria obtusa ‘Singapore’ produces white flowers with a bright yellow center and a strong citrus fragrance. The flowers range in size from 3 to 4 inches in diameter. Flower petals are defined as wide, rounded and separated. The keeping quality of these flowers is considered “poor” by some because they turn brown rather in a short period of time. Plumeria obtusa ‘Dwarf Singapore Pink’ is a true dwarf, well branched plumeria plant. Flower buds are light pink with the flowers being pale pink which is accentuated in a darker shade of pink at the borders of each petal. The center of the flowers is orange with some red. Flowers are up to 3 inches in diameter and have a citrus fragrance. The leaves of Plumeria obtusa ’Dwarf Singapore Pink", about 6 inches long and 2 inches wide, are shiny dark green. Would love to see photos of other varieties. I was hoping for more photos too, after your great descriptions. That Singapore looks rather as though someone has sewn very daintily round the edges of the petals! Steragram, the purpose of the picture is to show a close up of the flower. I'm going to post the picture of the inflorescence right now. How big does the Singapore Pink grow, and is it winter hardy?